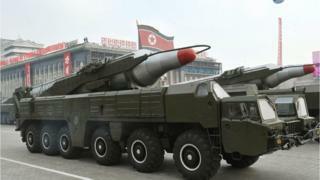 It is thought to be the second test of the North's new Musudan missile. An attempt earlier this month also failed. The tests come amid a recent ramp-up in weapons activity as the country prepares for a rare party congress. South Korean officials said the mid-range missile launch took place early Thursday morning near the eastern coastal city of Wonsan but the missile "crashed a few seconds later" in the coastal area, reported Yonhap news agency. What did each of the North's nuclear tests achieve? The incident was captured by a US surveillance satellite. One was launched two weeks ago and tracked but failed to go far. The same has now happened to the second, according to South Korea. Kim Jong-un is building up to a big event in just over a week, a rare meeting of the ruling Workers' Party in Pyongyang. He has trumpeted a series of announcements about progress towards having a nuclear-tipped missile capable of striking Washington. Failed launches indicate that the reality may not match the rhetoric. All the same, they indicate determination. A fifth nuclear test coinciding with the congress would not be a surprise. On Saturday, North Korea's foreign minister Ri Yong-su suggested that it would suspend nuclear tests if the US ended its annual military exercises with the South. But US President Barack Obama dismissed the proposal, saying it was not serious and that North Korea would "have to do better than that". Strengthened international sanctions were placed on North Korea after it tested what it claimed was a hydrogen bomb and launched a long-range missile. Over the weekend it also claimed it fired a submarine ballistic missile. Observers have speculated that Pyongyang is boosting the development of its weapons programs ahead of its political conference aimed at solidifying the power of its leader Kim Jong-un. The North announced this week that the congress, which was last held in 1980, would take place on 6 May.